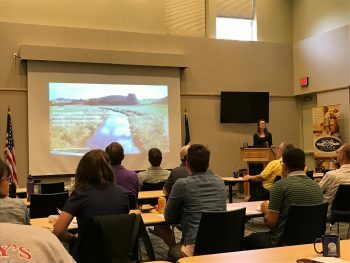 Over 50 town managers, planners, engineers and watershed professionals attended a watershed restoration planning workshop on May 25 to learn about how to reduce polluted stormwater runoff and restore coastal water quality. The workshop, entitled “Watershed Planning: Strategies and Tools to Protect and Restore Coastal Water Quality” was put on by the North Carolina Coastal Federation and the North Carolina Coastal Reserve’s Coastal Training Program. Representatives from the N.C. Division of Water Resources presented at the workshop. The workshop featured the Coastal Federation’s watershed restoration guide book and cost-effective management strategies that infiltrate runoff instead of letting it flow into our coastal creeks and sounds. Mariko Polk, GIS specialist for the federation and Hunter Freeman, senior stormwater engineer for WithersRavenel presented on the guidebook chapters, explaining how the user-friendly resource and GIS tools can be used to develop restoration plans. They specifically explained methods for setting quantifiable goals for reducing runoff. Freeman gave step-by-step instructions on how to use the Watershed EZ and Runoff Reduction Scenario tools, which assist with developing design scenarios to determine runoff potential with various approaches. 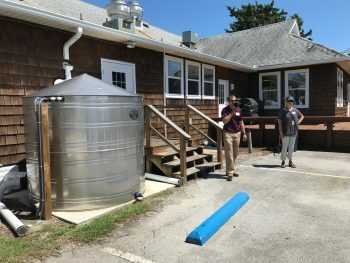 He presented on successful projects that have been implemented around Wrightsville Beach as examples of the impact of relatively simple approaches that target getting the rain to soak into the soil. The federation’s guidebook is organized to include the Environmental Protection Agency’s (EPA) nine minimum elements that are required for inclusion in plans that can be formally approved by the N.C. Division of Water Resources. Once plans are approved, they serve as a framework and plan for reducing runoff with targeted stormwater reduction measures. “We are pleased with how local officials, planners and the design community are really beginning to understand the value in reducing the volume of stormwater runoff in local watersheds and are interested in preparing plans to serve as the framework for setting goals and actions for stormwater reduction,” said Lauren Kolodij, deputy director of the federation. One of the nine steps of developing a plan is engaging stakeholders and getting the community involved in the plan. The federation and the reserve have been doing just that through the Beaufort Stormwater Advisory Committee, which includes staff members from the two organizations as well as Mike Randall with the N.C. Division of Energy, Mineral and Land Resources, town officials, academia and local stakeholders. Sarah Williams, deputy town clerk of the Town of Pine Knoll Shores, attended the workshop along with Brian Kramer, Pine Knoll Shores town manager. She said the workshop presented a great opportunity for Kramer and her to learn about various methods for capturing stormwater runoff. During the tour, participants were able to see various BMPs that were installed around Pivers Island, including this cistern. “It was a wealth of information — learning about watershed restoration plans and how they’ve been successful in other towns, specifically Wrightsville Beach,” Williams said. She was especially appreciative of a presentation that covered how the state can help fund these projects. Williams liked the opportunity to connect with stakeholders who can help with funding, especially as funds aren’t always available in local governments. “For me, one of the most valuable parts was listening to the N.C. Division of Water Resources representatives talk about how this plan is important and how it ties into being able to get some grant funding,” she said. After the presentations, the groups toured various stormwater projects that have been install ed around Pivers Island by Moffatt and Nichol. Projects included cisterns, permeable pavement, check dams and bioretention cells. To learn more about the watershed restoration planning guidebook visit nccoast.org/guidebook. For more information about the federation’s stormwater work, please contact Lauren Kolodij at 252-393-8185.